Extensive reworking of the antenna system was carried out just before Easter 2006 when I got home for the University vacation! Along with mum and dad, I spent a full day sorting the system out. Results have been excellent, and well worth the effort and stiff muscles! 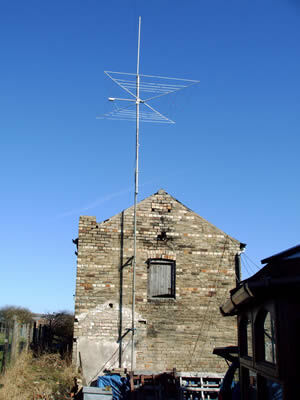 At about 30' above the driveway is the new G3TPW CobWebb, with a W300 2M/70cms antenna above that (about 33' at the base). The Half size G5RV is strung to a height of about 27' at that end. This took a huge effort to put up, as the mast comprises of a 20' steel scaffold pole plus the extra stub mast! The other end of the Half size G5RV is attached to the mast tot eh right, the feeder slopes off to the house in a less than ideal way. 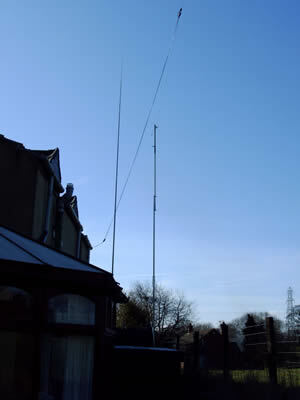 The mast to the left is a 9M roach pole with 19M of wire wrapped round it. This makes an approx 1/4 wave vertical for 80M, fed against the fence of the adjoining field (no balun, just direct coax feed).